Holy cow…great catch! Yes, 80 degrees Celsius would be just a BIT too warm. 😉 Thanks so much…it is now fixed! Sound like your P. cambridgei could also be male. Generally, males will grow faster than their female sac mates. And it out-eats a GBB and a P. cancerides? WOW. That is truly impressive, as though two spiders are some of the best eaters in my collection! It’s amazing how much just a few degrees can do for their appetites. I had a similar situation where I moved one of my P. cancerides to another shelf that just so happened to be a bit closer to the heater and, therefore, warmer. That little gal turned into even more of an eating machine, and ended up molting twice in the time her sac mate molted once. It’s funny, because I power fed MY A. versicolor when it was a sling for that exact reason. How large of a sling are your receiving? The color changes these guys go through as they grow are amazing. Thanks for reading a for catching that error! Don’t feel like you HAVE to power feed it. I found that mine was eating like a champ, and I was very worried that I was going to screw up and end up with a dead sling, so I gave her as much as she would eat. I had just heard so many cautionary tales about SADS (especially with versicolors) that I couldn’t help but to worry. I ended up keeping mine on the dry side after reading accounts by several more experienced keepers who had great success with them (and no SADS). The general consensus now is that it was the overly-moist, stuffy cages that was killing them all. For years, folk would keep these things wet, restricting airflow in order to keep the humidity up. This is when the versi got the reputation for being fragile and difficult to keep alive. However, once folks supplied more ventilation and put less of an emphasis on keeping them wet, they started thriving. Something to think about. It’s tough, because if you look up care sheets for avics, many of them STILL say to keep them moist. I had to really start talking to some keepers and researching more current info on the boards. When I chose to keep my versi drier, I was REALLY worried for a bit. But even with the humidity in my house dipping to the teens during my first winter with this .5″ sling, it still thrived. Man, I’m very jealous of your P. subfusca highland! I’ve been eyeing one for a while, and I just haven’t gotten around to getting one. I currently keep eight species of pokies, so I really need to fill that hole in the collection. Lol I don’t blame you one bit for keeping it..they are fast as heck, but oh so gorgeous. I agree completely. When you consider what it’s like for these guys in the wild (and some live in some pretty inhospitable locales), it would make sense that they would be able to gorge themselves when food is plentiful. Like you said, this is an instinct, not “Tom is bored so he’s going to go gorge himself on a bag of chips.” Nature has taught them that when there is food, it is time to eat. And, considering many are from areas where temps will fall seasonally and prey will become scarce, you also start to understand these mysterious “fasts” some will go on (I’m looking at YOU, my little G. rosea sling!). I get that some folks worry about their long-term health, and I agree that could be a concern. But I also think that this idea comes from people comparing them to other animals, like snakes, and that’s just not a fair comparison. I feed mine on the same schedule as you. When they are done eating, they either tell me by closing up shop or by slapping the prey away (which causes me to quickly remove it). Unfortunately, I think we’re part of a very large club. 😉 Honestly, I should complain because in the 19 years I’ve had my G. porteri, she has NEVER refused a meal. That is almost unheard of. My little rosea sling? Not so much. She fasted from about October of last year until May of this year. The whole time, she looked plump and like she could possibly molt, but her abdomen never got dark. So, in May, I threw a tiny cricket in…and she ate! She ate twice more after that then…back to fasting. Gotta love them roseas! Yup, I play the once a week game, too. And every once in a while, I don’t see the cricket and think they ate it, only to find it later. Such as let down. Don’t these little guys know how much we worry? Ha! My G. pulchripes slings (which ARE eating at the moment…yay) used to run from live prey. They have now grown up a bit and are stone-cold killers. HAH! No sooner than I get this done, and the little bugger did it. LMAO…and sigh. 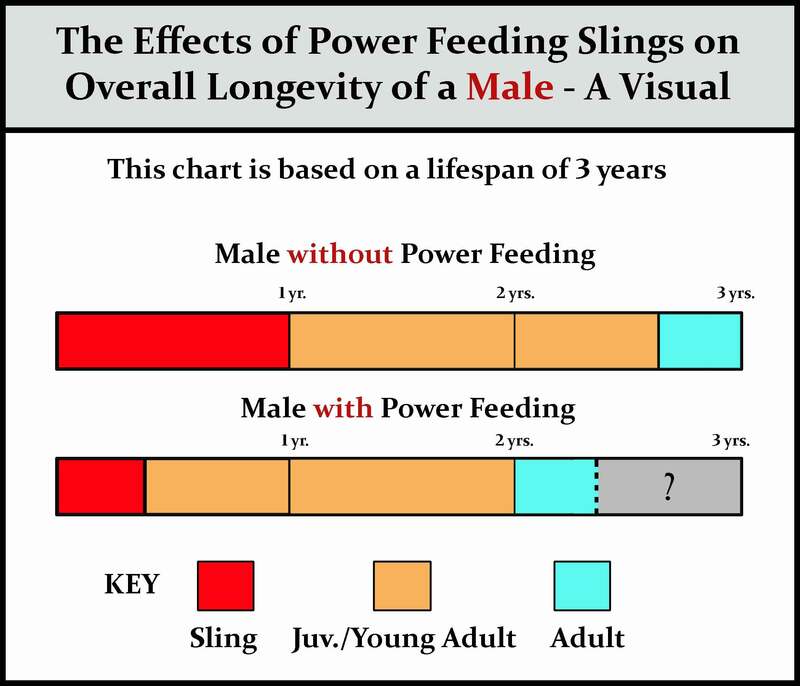 I used this as a reference link in the T.Keepers group (Scott Templemen’s) on FB, referencing some sling feeding questions and one of the admins slapped me for posting “power feeding”. When I disputed that, she said “I read it, and it promotes power feeding.” I almost asked her if we should have a T-weight-watchers group. gah. What?! Hahahahaha. That is hilarious! Seriously, I tried to write that as impartially as possible, but the more research I did, the less I found to support all of the myths that those against “power feeding” offer up as evidence against it. 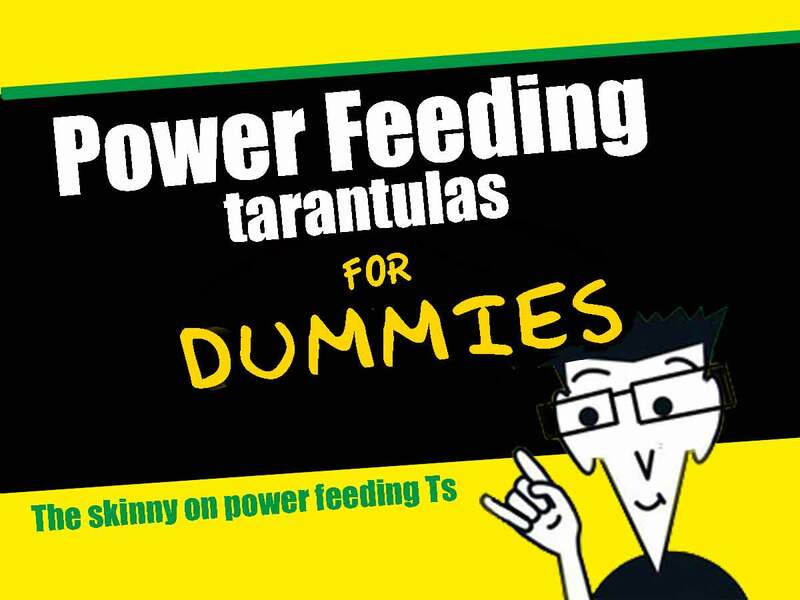 I guess as it took shape, I found myself addressing more the issue of power feeding being vilified by some. 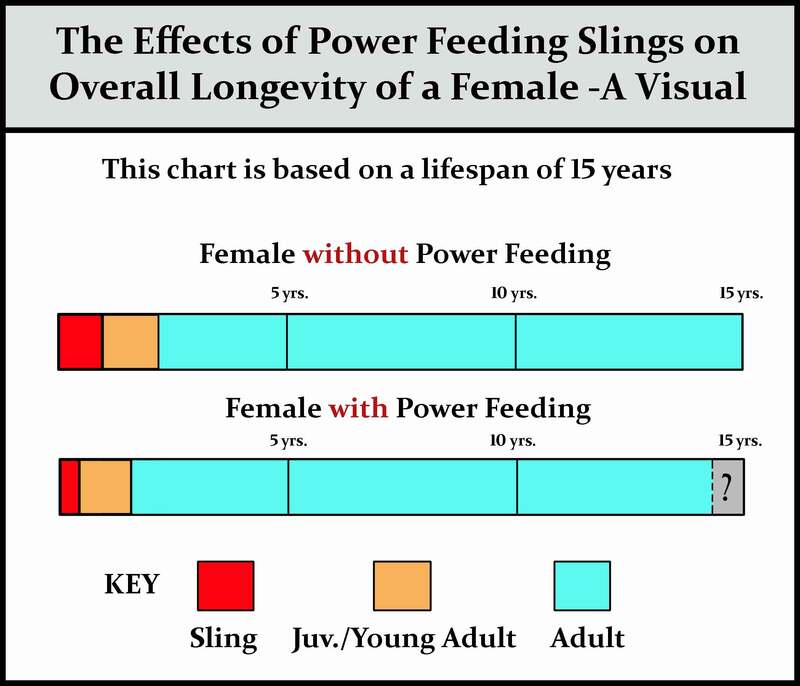 And, as I tried to show in those charts, if you power feed a sling, how much time are you REALLY decreasing its lifespan? If a person doesn’t want to try it, honestly, that’s TOTALLY fine. I completely understand. However, don’t start judging folks who decide to get that spider out of its fragile sling stage a little faster. You’re right, bud…”Religious” definitely doesn’t stop there. but once I start seeing “ethics” pop up around animals, I start looking for PETA. I might have to be-bop to the handler group…big group, but much less “focused” if you will on how to TREAT the babies. -gads. Scott Templeman: My point of view when it comes to powerfeeding is one where there are avenues where it is advantageous, required even… For very rare species and breeding purposes. I have even experimented with what most would consider under-feeding, and the results were… Pretty much the same when it came to a fast growing male species… Except he matured smaller stature. Does that make power – feeding a good idea? No, if only for ethical reasons for the most part.. But occasionally it is required in a tiny fraction of examples. I avoid the public snits as well, so I don’t blame you one bit. Ethics…the reason is now “ethics”? As in, “it is ethically wrong to feed a spider a lot food?” Sweet Mary…I can’t stop laughing. Not to be a jerk, but with ALL that’s going on in the world, I honestly can’t believe that someone called power feeding ethically wrong. Man, I love animals…always have. However, this is just a bit absurd. And by his example, it’s apparently okay if you’re power feeding to bring a rare species INTO A HOBBY to inevitably make money on selling high-priced slings, but not okay if you want to possibly usher your pet through a vulnerable period. I’m agnostic. I’ll think happy thoughts for you. And 1000% agree with your take. That was mine…including the jaw dropping wide as I read it. Crap…as am I. Guess I’d better just live with my unethical behavior. Seriously, I’m so glad that you shared this with me. I can’t even be upset because the word “ethics” just made the entire thing silly. It just bothers me that folks with a bit of experience can spout off nonsense as if it’s fact, and those new to the hobby could believe it. Ugh. Just got booted from the T-keeper group. Sent you mail with the thread. Thought you’d get a kick out of it. Regarding soft fangs and the poor fluffy bunnies that T’s all are. -snicker. I just responded. I’m floored. I can’t stand when people try to turn approximations into “rules” and speculation into “fact”. I recently got my very first Ts this past December (all slings) and I’ve been feeding them every other day based on what you said in your videos on sling care (which I watched a million times! ), and I live in San Diego and somehow my sling shelf often hits 78° even though my space heater is only set to 70 and doesn’t run often, and they’re all growing so much faster than I expected. One person I follow on Instagram has two species about the same size that I have, she’s had them since August and they’ve only molted once whereas all of my slings except one have molted twice since December! I wondered if she was barely feeding hers or something and I recently saw her caution someone else against feeding often, and it all made sense. The other person had a G pulchra that grew quite considerably in about 6 months. I wish there was more scientific evidence regarding this issue, but it makes sense to me that you can’t compare spiders to snakes and it doesn’t make sense to apply snake power feeding issues to spiders. I think that is ultimately well said, that it’s down to personal preference and opinion. For those that are against it on the grounds of it being unethical I would suggest that feeding not so often like once a week, once a month or less could be seen as less ethical than feeding every day as anyone who keeps tarantulas will know that you can’t force them to eat, you can offer them food but they will only eat it if they want to thus ultimately the choice to eat is the tarantulas and feeding less often is taking some of that choice away from the spider. Also I totall understand keepers powerfeeding during the sling stages to get it to a less vulnerable stage asap, some rare species can cost upwards of £500 for a sling and all slings can be notoriously difficult to raise in the sense that with them being so small, delicate & other vulnerabilities that there’s so many factors that can cause a sling to die and most of these issues can overcome a sling that rapidly that usually the first sign of an issue is finding your sling in death curl and has already passed away. This can happen to all keepers irrespective of experience. I’ve previously lost slings and I know many other highly experienced keepers to lose slings for no apparent reason when they’ve provided it with care to the letter. It’s nature and the reason why egg sacks can contain hundreds even thousands of offspring because in nature only a small percentage of eggs laid will eventually grow and mature into breeding adults to complete their lifecycles. Thanks, Matthew! The biggest issue with small slings is they lack the waxy layer that prevents dehydration. That makes them more susceptible to sudden deaths.